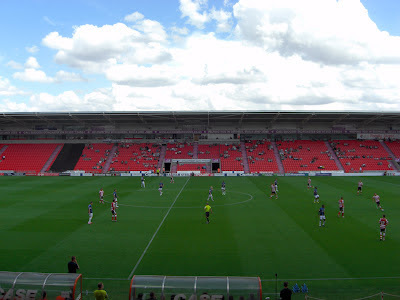 My fourteenth stadium of 2012 was on Saturday 4th August 2012 at the Keepmoat Stadium in Doncaster, South Yorkshire. 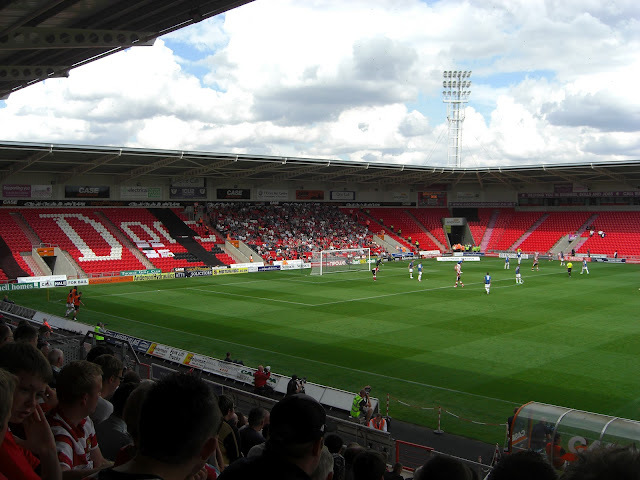 The match was Doncaster Rovers vs. Barnsley in a friendly game. 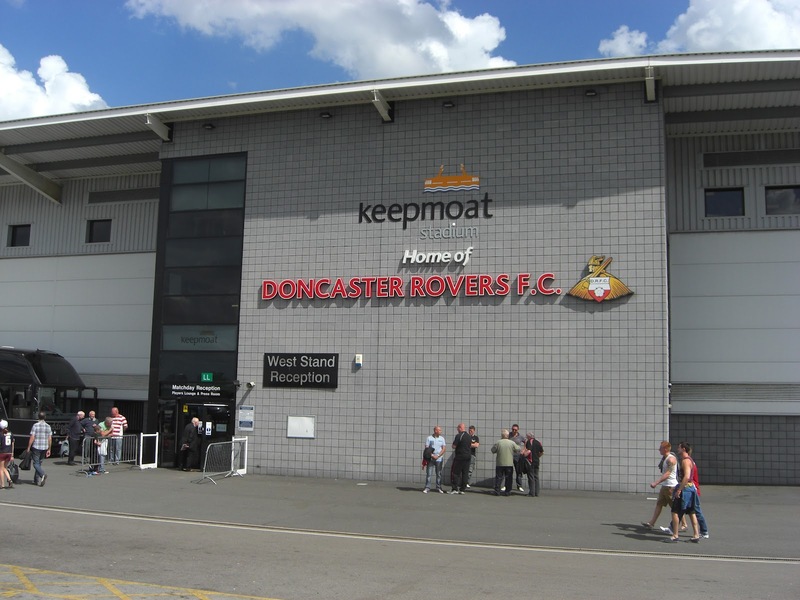 The Keepmoat Stadium is situated in a sports complex just to the south of Doncaster town centre around 1.7 miles from Doncaster railway station. The ground has been home to the club since 2007 when they moved to the venue from their previous Belle Vue stadium where they had played since 1922. The ground is a single-tiered bowl which has a total capacity of 15,231. The West Stand runs alongside the pitch and is the main stand in the ground. It contains the players dressing rooms as well as the media centre and reception area. Opposite this is the East Stand which features a number of executive boxes and includes the family section towards the southern end of the structure. Behind the goal at the southern end is the South Stand which includes the ticket office and club shop. Finally, at the other end of the pitch is the North Stand where away fans are seated. As the stadium is part of a larger sports complex there is a small athletics stadium directly next to it featuring a 500-seat stand which is the base for athletics in the town as well as the home for other sports teams. The game was a friendly match between Football League One side Doncaster Rovers and Football League Championship side Barnsley. The first goal did not take long to arrive as Doncaster's Martin Woods cut inside a defender and took a shot which took a deflection on the way through and bobbled into the bottom corner of the net to give the hosts the lead. In the 25th minute the visitors equalised when the ball was sent across the six-yard box and defender David Cotterill slid the ball into his own net. In the opening period of the second half Craig Davies was twice sent clear of the Doncaster defence but on both occasions shot wide. However, the home defence did not learn their lesson and in the 72nd minute Davies was once again sent clean through and this time made no mistake as he stroked the ball under the advancing goalkeeper. 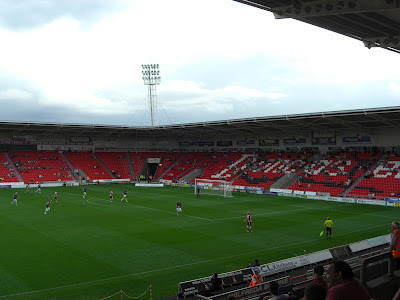 Just a few minutes later however Doncaster levelled when a corner flew over Ben Alnwick in the Barnsley goal presenting David Syres with an open net in which to place the ball. The game finished 2-2 which, between two evenly matched teams, was a fair result.